καθιστικό και κουζίνα, 3ο τρίμηνο, 2 Γ Μπανιέρα, μεγάλη βεράντα, γκαζόν και ιδιωτικό εξωτερικό. Σπίτι που βρίσκεται στην Ενορία (χωριό) Μπισκότα, κοντά σε όλα (παντοπωλείο, αρτοποιείο, εστιατόρια, ...). Πολύ ήσυχο και χαλαρωτικό 500 μέτρα από τη θάλασσα και τις διάσημες φυσικές πισίνες μπισκότα, πεντακάθαρα και δροσερά νερά. Σπίτι με μια εξαιρετική και ευρύχωρη βεράντα, να μοιραστείτε και να απολαύσετε το γεύμα σας ή απλά να χαλαρώσετε σε επαφή με τη φύση. Σύνολο ιδιωτικής ζωής στον εξωτερικό χώρο με γκαζόν και προστατεύονται από δέντρα και θάμνους. Οχήματα είναι εντός της ιδιοκτησίας. Ευκαιρία για την παροχή αυτοκινήτων, μετά από επικοινωνία με τις inclinos. Εταιρικής σχέσης με την "AzoresTouth" για όλα τα τουριστικά animation. The hosts were gracious and helpful. They came in to town to have us follow them to the house, provided us much information about he island and even left us with a full bowl of freshly picked figs. The house itself was perfect. Large open spaces, nicely fitted, clean and very comfortable with all we could need. The front patio/outdoor kitchen (where we spent much of our time) was an absolute delight and the yard roomy and well maintained. Good wi-fi in and out. Just a 10-15 minute (short for us) walk to the sea, swimming holes, restaurants, small grocery stores, bakery and butcher shop. The only downside (which we realize is beyond the control of the owners) was the constant barking, day and night, of many dogs. 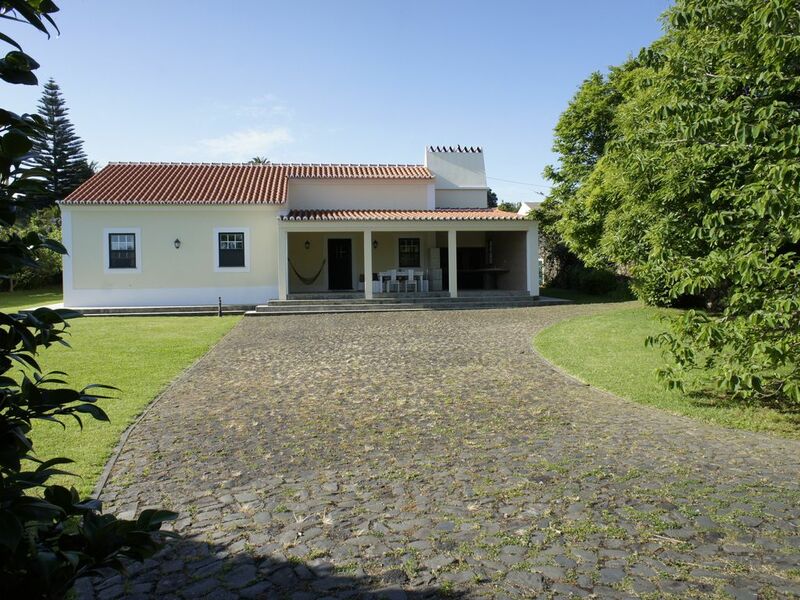 It was the very best of our 4 accommodations while visiting the islands (especially when we realized that barking dogs seem to be a standard in the residential areas of the Azores). Would return and certainly will recommend. Thank you Rita Burke for your good opinion about our house and about us. We are always available for new visits. Obrigado Sr. Luis Gomes pelo comentário. Ficamos sempre disponiveis para novas oportunidades. We really enjoyed our stay at this nice villa. Hosts are always responsive and addressing all issues quickly. We found the villa very clean, functional and friendly. Natural pools are within walking distance; small supermarket is also nearby. Having a rental car allows you to discover other spots in Terceira. A estadia foi muito agradável, a casa é muito bem equipada, acolhedora e funcional. Tem um ótimo espaço exterior e ambiente sossegado. Recomendo. Bereits im Vorfeld wurden unsere Anfragen sofort von den Eigentümern beantwortet .. Verspäteter Flug , Bitte um Grundausstattung für das 1.Frühstück alles völlig problemlos. Das Haus mit einer schönen überdachten Terrasse und dem großen Garten hat uns gleich sehr gut gefallen. Bei der Einrichtung fehlt es an nichts. Wir waren mit 4 erwachsenen Personen dort und hatten ausreichend Platz. Auch die Lage ist ideal. Man ist schnell zu Fuß an den tollen Naturschwimmbecken in Biscoitos .Fazit das Haus können wir 100 prozentig weiterempfehlen..
Zentrale ruhige Lage, guter Ausgangspunkt für die Inselerkundung. Sehr nette Besitzer, tolles Haus und Garten, kann insgesamt alles empfehlen. Auch die Insel ist sehr schön und man kann gut entspannen und wandern. Κρεοπωλείο των Αζορών νωπό κρέας.